An herbaceous twist on a classic at downtown's World of Beer. 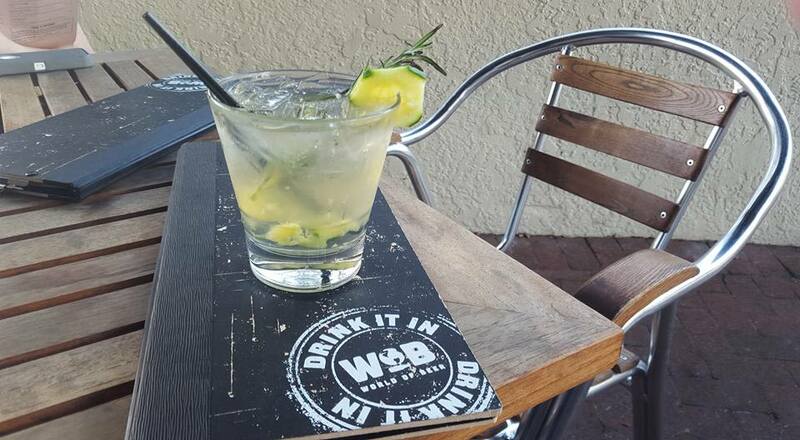 This week: The Spanish G&T at downtown Sarasota's World of Beer. The drink: Sacrilegious as it feels to order a cocktail at a craft beer establishment, WoB's cocktail menu tells of an apparent "obsession" with gin-and-tonics in Spain. (Google tells me this Spanish fervor was taking place circa 2012, but we'll roll with it.) This G&T adds to the titular ingredients muddled cucumber and elderflower liqueur with a cucumber slice and rosemary sprig garnish. Gin and cucumber are an established pair--the mild, melon-y vegetable countering the liquor's herbaceousness--while the liqueur adds an interesting flowery note. I dig it. The bar: One of Sarasota's best locations at the corner of Main and Links, WoB has seating inside and out, upstairs and down, plus a long bar to belly up to. A go-to spot for anyone and everyone who finds themselves downtown and thirsty. Food: Burgers and a variety of other sandwiches. Not haute cuisine, but certainly above average. Other notable potables: As I said, it feels a bit counter-intuitive to order a cocktail at a place with such an outstanding beer selection, but give WoB credit for catering to the non-suds-lovers among us. The cocktail menu takes some chances mixing classic cocktails, high-end spirits and a few unexpected twists, like a margarita with strawberries and cucumbers, or an "Irish mule" with Jameson Whiskey, simple syrup, lime juice and fresh mint. And let me just say that I am equally intrigued and horrified by the "Kentucky Hard Root Beer"--framboise syrup, rye whiskey and hard root beer topped with whipped cream.